Want to up your potato salad “game” this summer? A flavor boost from the grilled new potatoes, and the creamy harissa yogurt and preserved lemon is sure to make Grilled Potato Salad Moroccan Style your new favorite side dish for warm weather holidays, picnics, and lazy Saturdays on the patio with the grill going! 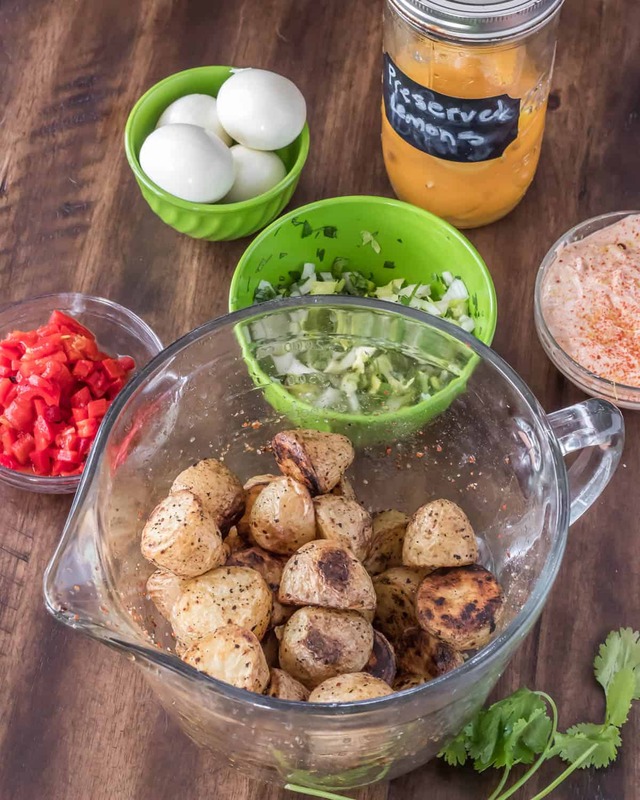 Summer is fast approaching (especially here in hotter-than-you-know-where south Texas)… Memorial Day, Father’s Day, the Fourth of July, all call for potato salad. Yay or nay? My mom made the most awesome classic American potato salad. I’ve made it for years, but it just never felt like mine (because it wasn’t? 😮 ). As I planned my calendar for the months of May and June, I penned a note to come up with my own version of potato salad. Healthy with global flair, right? You may have noticed my recent obsession with all things Moroccan/North African? I did North African Grilled Chicken and Veggie Bowls, Easy Moroccan Preserved Lemon Yogurt Sauce with Fresh Herbs, and Moroccan Couscous with Chick Peas, Spinach, and Dried Fruit just in the last few weeks! I guess those flavors just call my name; when I decided I wanted to do a grilled potato salad, harissa and yogurt just came instantly to mind. I finished a jar of preserved lemons a few weeks ago, and I’m in love. They’re probably behind my love affair with Moroccan flavors. What is harissa? Harissa is a hot chile pepper paste composed of dried red chiles, fragrant spices, olive oil and garlic. It is supposed to have originated in Tunisia, and is most closely associated with Tunisian, Algerian, and Libyan cuisines. It is becoming quite popular in Moroccan cuisine as well. Harissa paste is available commercially, but it just doesn’t match the fresh, vibrant flavors achieved in your kitchen with your own toasted spices, fresh ingredients, and good dried chiles. Recipes vary greatly; the paste may include fresh or dried mint, roasted red bell pepper in addition to the dried chiles, lemon juice, etc. The chiles that provide the heat may be hot like cayenne and chile de arbol, or milder like ancho. You can use any chiles you like and have on hand. North African varieties are not necessary to make an authentic harissa paste. Don’t just start cooking! If you’re not already doing so, remember mis en place (a fancy French term for assembling and preparing ingredients prior to cooking)! So, that means slice (if necessary) your new potatoes, chop the piquillo (or roasted sweet red) pepper, celery, preserved lemon, and onion. Gather the remaining ingredients. Hard boil the eggs, and parboil the potatoes. Why parboil the potatoes? My #1 reason is that the potatoes are more likely to be cooked all the way through. Do you like crunchy, starchy potatoes? Neither do I! I also appreciate the opportunity to season the potatoes. Be generous in salting the water! For more on this topic, see 3 Reasons You Should Boil Potatoes Before Grilling Them. Preheat the grill to medium-high. Toss the potatoes with a generous drizzle of olive oil, and grill until tender with nice grill marks. Set aside until ready to assemble. 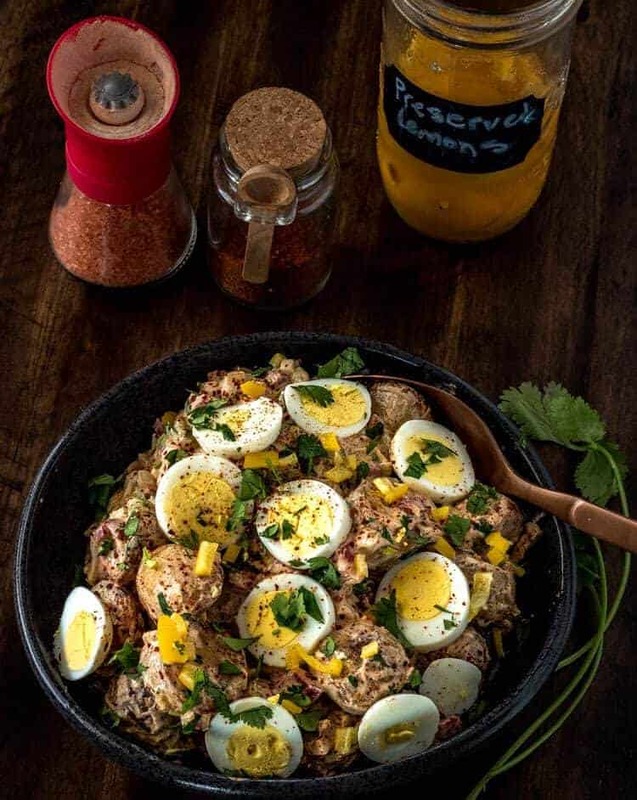 Elevate your potato salad with Moroccan flavors! Preserved lemon and harissa bring exotic flavor to a summer classic! Parboil the potatoes. Don't forget to salt the water! I aim for 6-7 minutes when I'm grilling them. At the same time, go ahead and get your eggs hard boiled if you haven't already. If you read the post, I emphasized mis en place (ingredient prep). Start at the top of the ingredients list, and get everything ready. Drain the parboiled potatoes. Drizzle with olive oil, and sprinkle with salt and pepper. Toss to combine. Grill the potatoes. I use a grill basket, and rotate or shake it regularly. Cook until potatoes are tender when pierced, and you've got nice grill marks. (See prep photo above). Set aside. Mix all Harissa Yogurt ingredients together. ( I mix up the Harissa Yogurt while my husband grills the potatoes). To Assemble: Add grilled potatoes, vegetables, and preserved lemon to an appropriately sized salad bowl. Gently mix in the Harissa Yogurt. Check once more for seasoning. 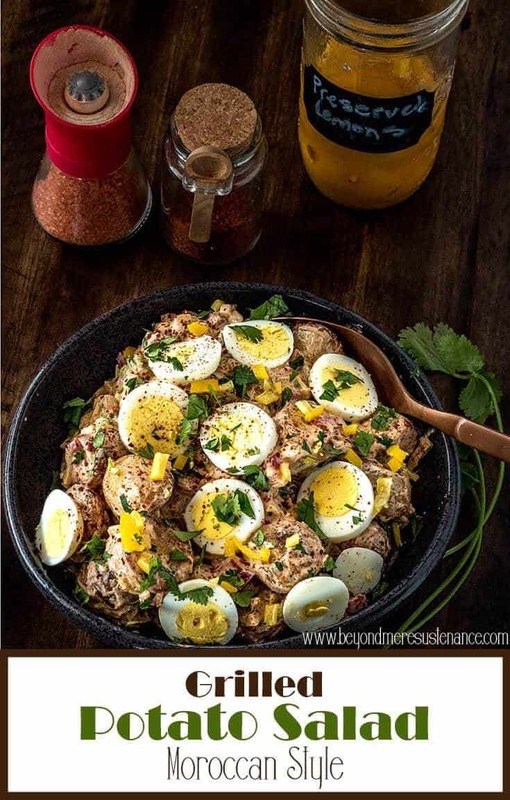 Garnish with sliced hard boiled egg and chopped cilantro. I used new Yukon Gold potatoes, and sliced the larger ones in half. See prep photo. I find chunks easier to manage on the grill than slices, but it's up to you. Pieces that are too thick will be difficult to cook through, and too thin, they may fall apart on the grill. Parboiling your potatoes makes for more even cooking. Avoid al dente potatoes! I did about 6 minutes with my new Yukon Gold potatoes. I prefer a more mild onion (scallion, sweet, shallot, red). You can use your preferred onion! For more on preserved lemons see Easy Moroccan Preserved Lemon Yogurt Sauce with Fresh Herbs. You can make your own or find them in the International aisle of many local markets. You can also find them on Amazon. Harissa paste may be hot or mild. Taste it. Add accordingly. Macronutrients (approximation from MyFitnessPal.com): 207 calories; 15 g protein; 25 g carbohydrates; 5 g fat. This is not your grandmother's potato salad (unless your grandmother was Moroccan, maybe). I'ts really good, though. Lol. My "Okie" grandma is probably rolling over in her grave! I know how you love spice, and I know you'll love harissa! You can make your own (I do sometimes), but I have found Mina Harissa is a good substitute for homemade!